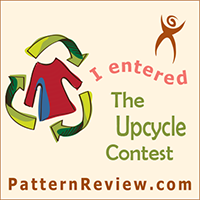 This repurposed outfit was created as an entry to the Project Run and Play's Season 10 Challenge for Week Two. The cost for the whole outfit was $10 for the ribbon and buckle. Everything else was either repurposed or in my stash already! Very cute. Love the horse print! Great outfit and great job repurposing! What a lucky little princess. Adorable, I would totally buy that! Really sweet outfit and story! I love this upcycle! My girls would crazy for that horse fabric! Creative, creative! Isn't it amazing how cute little girls can make things so cute? You did awesome! Elizabeth, I like how the jacket turned out too...but I really like how my granddaughter feels special in the outfit I created just for her. She is my crafting buddy, is better with glue that me, and wants a sewing machine of her own even though she is only five. Learning How to Thread a Needle.